Whether you live in the Asheville area or are coming to town for a visit, the OM Sanctuary needs to be on your list of places to visit. You can take a stroll through the beautiful Serenity Gardens that includes a tall waterfall with Japanese koi fish and take a nature walk on our Tranquility Trail in the forest. Or come and enjoy one of our Rest and Renewal classes, which are complimentary for our guests and are offered at a $10 drop-in rate for our visitors. Our classes include a mix of yoga styles, meditation, QiGong, and Tai Chi. We are excited to be hosting two new yoga classes taught by Elle Jai Taylor E-RYT500 and Jessica Chandra Shrago CYT 250. Each of these teachers are deeply committed to the practice of yoga and feel joyous to be able to give back to the community of spiritually minded people that are attracted to Asheville. Elle Jai is a registered yoga teacher at the500 -hour training level and has been immersed in the yogic lifestyle for 25 years. She also owned an ashram and yoga studio in Pennsylvania called, Sri Yantra Yoga, for 15 years. Elle’s classes are a taught in a light but deeply thoughtful style that will allow you to feel that you belong there regardless of experience level or age. Her wisdom shines through her laughter, sparkling eyes and teachings. Jessica Chandra was formally trained in 2008, during a 250-hour teacher training program. She studied Classical Raja Hatha yoga, at the former yoga studio, Namaste Yoga Sanctuary in beautiful Asheville, North Carolina. Raja is one of the four paths of yoga. Hatha incorporates balance, as ‘Ha’ means Sun and ‘tha’ means Moon. This style of yoga focuses on uniting these opposing qualities of the body/mind, to better prepare the practitioner for meditation. 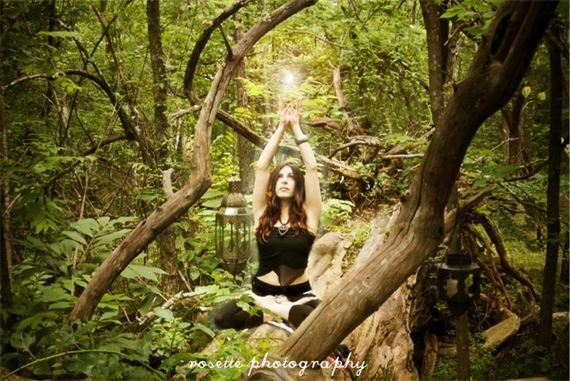 To read more about her classes and background, please visit: www.ChandraDeviStarYoga.com. 18 Nov	This entry was published on November 18, 2014 at 9:00 am and is filed under OMS Interest, Programs, Rest and Renewal Stays, Uncategorized. Bookmark the permalink. Follow any comments here with the RSS feed for this post.